dusty road in Bill’s SUV, kayaks on the hood. As we chatted about the last time we paddled Blackwater, and we took in our surroundings, Bill brought his car to a sudden halt. A diamondback rattler lay curled on the road in front of us. I dove for my camera on the back seat, but missed the shot; the snake had slithered away. I was thrilled to be returning to Blackwater Creek with Bill Belleville (Florida writer, filmmaker, nature lover); it had been over two years since our last paddle—way too long! We put in at the same spot as last time, the bridge in the Seminole State Forest. However, this time, we chose the upper river and paddled towards the creek’s source, Lake Norris. Two years ago, we had paddled the lower section towards the Wekiva River. The coolness in the breeze signaled fall had arrived at last; the sun peaked from behind the clouds. What a gorgeous day! We paddled away from the Sand Road launch against a slight current. Leaves fell from the trees, dancing, twirling on their way to the creek’s surface. 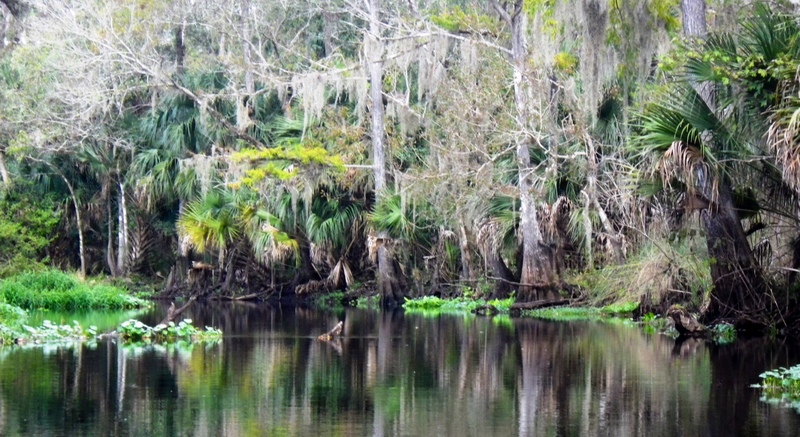 For the next few hours, we explored the beautiful, twisted Blackwater Creek, catching a glimpse of the natural Florida, quiet and serene. Bill had predicted that we would be challenged with many deadfalls as the upper creek is not kept clear—and we were. However, by the end of our paddle, I believe we had both mastered the deadfall shuffle and the forest limbo! Any challenge we faced was well worth it; we watched as bees and butterflies paid homage to a beautiful, blooming Carolina astor and hawks coasted on the vents above us. Browned cypress added fall décor to our surroundings of tall pines, oaks and palmetto palms; water lines on their trunks marked the higher summer levels. 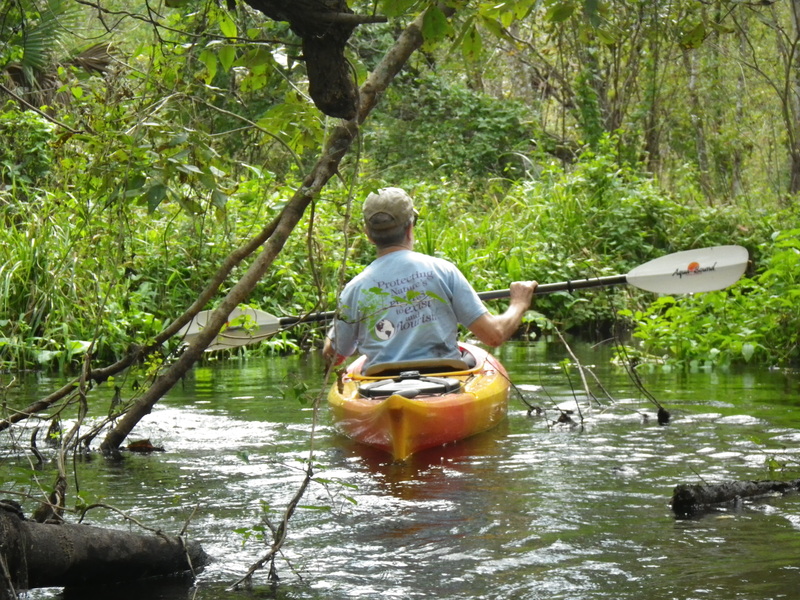 We paddled our way through Pennywort and Pickerelweed, and I had to laugh when I spied a rafter of turkeys running on the forest floor deeper into the trees—I could see their heads bobbing up and down; my first thought was “little forest people.” We paddled under flocks of ibises sitting on branches overhanging the creek. They seemed to be enjoying the waterway as much as Bill and I. An hour into our paddle, Bill and I took a waterway to the left where there seemed to be a strong current. We were surprised to make it another hour upstream, and decided it was time to turn around. With the current, we made it back to our launch in an hour. Thank you, David. I’m glad you enjoyed it!